David VanWert’s 20 years of experience in system integration makes him an expert in technology design, consulting, and project management in the home automation industry. The company he founded, VanWert Technology Design in West Hollywood, was one of the first of its kind in the nation, and so it seems only natural that he was asked to be one of the Control4 CEDIA Design Connection Tour leaders at the 2018 Expo in September. David provides expert technology solutions for his clients, so we asked him for his expert opinion on leading the CEDIA Design Tour, how his business is unique in the industry, and what he recommends for a designer to get started with home automation. My company is a design consulting firm when it comes to technology. The analogy I like to use is that we are like an architect, an electrical engineer, or a designer but for the technology aspect of the project. We do not sell the technology, we do not install it, but we design it into the home. I’ve been on the integration side of things for the better part of 20 years. I got into being a technology consultant after I saw the need for the expert—clients would hire other experts, but there were no experts for technology back then in that consultant role. We filled that gap by becoming a design team member that comes up with what we feel is the best solution for the scope, project, client wants, etc. I get to be a third-person expert that can step in and provide a technology plan based on the situation and solutions available. No one wants to see the ugly boxes and tech, so our goal is to make the devices melt away while still being high-quality, reliable technology that is easy to use. How did you become a CEDIA Design Connection Tour leader? They reached out to me, actually. The White Good committee was looking for two individuals across the industry, a CEDIA member and a non-CEDIA member, so that designers could get a wide variety of insights from experts. Being a non-CEDIA technology consultant was something that drew them to me I think because they wanted two completely different experiences each day of the tour, and they felt my outside perspective would pair well with an inside perspective. I lead the first day of the tour, and it was a great experience. What were your goals when speaking with designers on the tour? My biggest goal and the theme I created for my entire tour was to not talk about technology, but for me to focus on how technology can enrich designers’ clients’ lives. How by incorporating technology into design, they can make their clients’ lives easier, and how they can make their designs look good. That’s why I chose a wide variety of technology on my tour—so I could highlight a little bit of everything to show how the technology can enrich their projects while not bogging them down with details. What were your thoughts after leading the Design Connection Tour? Overall, I thought it was great. Most of the designers were very engaged, and they asked a lot of questions. It showed me that there is a real interest from the design industry when it comes to home automation and that they are eager to learn about new technology. We touched on quite a few high notes, from lighting and mirrors to the overall theme of the esthetics. One of the biggest things that surprised me was the question I got about networking and cybersecurity; I wasn’t expecting that level of technical interest from designers, but I learned that they really want the best for their clients and are very concerned with making sure their clients are protected. How do you recommend a designer get started in home automation? Another theme of my tour was to engage smart home professionals early in a project. Whether it is someone like myself or a local smart home expert in their area, designers need to find someone they are comfortable with in the automation industry and engage them in a project as soon as possible. Don’t bring them in at the last minute—they can offer a lot during the planning stages of a home. Technology experts can offer suggestions for placement of closets and design elements that will save a tremendous amount of headache down the road rather than if the designer tries to add it in later. It is also important to get a home automation expert in during the budget and planning process in order to get a better idea of what a designer will need to give their client a true smart home experience. 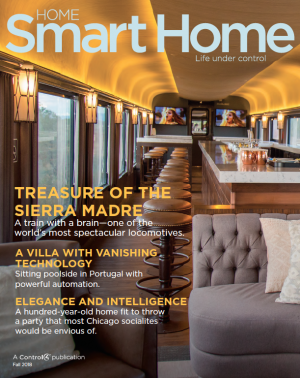 VISIT A CONTROL4 CERTIFIED SHOWROOM TO SAMPLE INCREDIBLE SMART HOME SOLUTIONS. WANT TO LEARN MORE ABOUT HOW CONTROL4 FACILITATES BEAUTIFUL SMART HOME DESIGN? CLICK HERE.